BUT, it does not have to be that way. If you’re already a member of The Dinner Daily you know that our ready- to- go customized meal plans, easy and healthy recipes that leverage the store specials at your local grocery store, and organized shopping lists are lifesavers for getting through those busy weeknights. 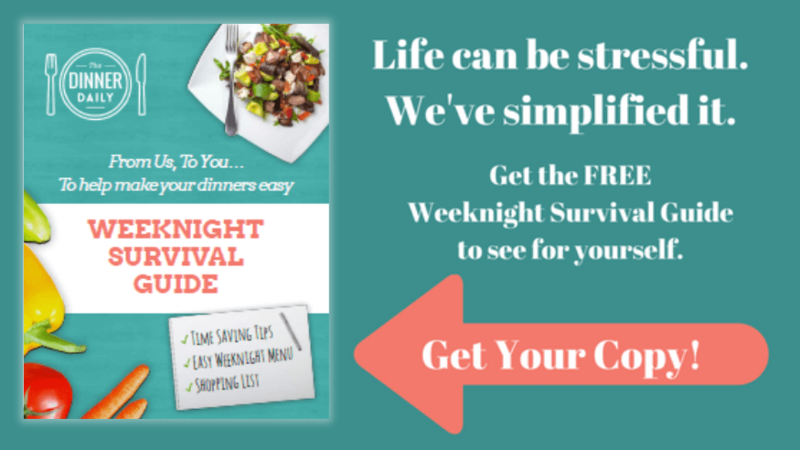 For those of you that have not joined the Dinner Daily movement, we have some happy news for you: we have a free weeknight plan to get you through your week to give you a small taste of how we make life easier: our Weeknight Survival Guide! And, we REALLY want to see your results! Use these recipe ideas for dinner this week and post an image on your social media accounts. Tag them with the hashtag: #WeeknightSurvivalGuide and we will share your pics on our account too. We are excited for you to try out these great dinner recipe ideas. Already a member? Feel free to download your guide too! Enjoy!